No time to plan a special dinner to mark Halloween? No worries! Pull out a frozen cheese pizza and some Parmesan cheese and get ready to get crafty! Prepare pizza as directed on package. Meanwhile, mix cheese with food coloring until evenly tinted. Place open-topped Halloween cookie cutters or stencils over hot pizza. (Careful, pizza will be hot!) Sprinkle cheese lightly into cookie cutters. Lift off cookie cutters with both hands to reveal design. Serve with baby carrots or pepper strips and fat-free milk for a festive dinner at home. 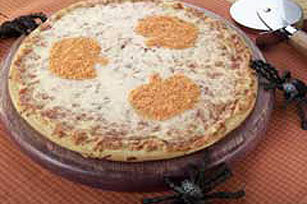 Create a jack-o'-lantern face on your pizza. Top unbaked pizza with assorted cut-up vegetables, such as peppers, mushrooms, onions or olives, in a face design. Bake as directed on package.